"The only way to stop this war, is for you to take your rightful place as king." Warner Bros has released the first official trailer for James Wan's Aquaman movie, following its debut in Hall H at Comic-Con in San Diego. This is another epic trailer, giving us a very exciting first look at this new DC movie, which fans have been waiting to get a look at for a while now. The character of Aquaman, also known as Arthur Curry, first appeared in Zack Snyder's Justice League movie, and this solo feature takes place after the events of that movie. Jason Momoa stars as Aquaman, with Amber Heard, Nicole Kidman, Randall Park, Patrick Wilson, Dolph Lundgren, Willem Dafoe, Graham McTavish, Temuera Morrison, Michael Beach, Ludi Lin, and featuring Yahya Abdul-Mateen II as Black Manta. This is looking very good and action packed, with some big moments teased - an epic underwater war and lots of cool creatures. Dive in. For more updates on DC's Aquaman, visit the official website or follow on Twitter @aquamanmovie. 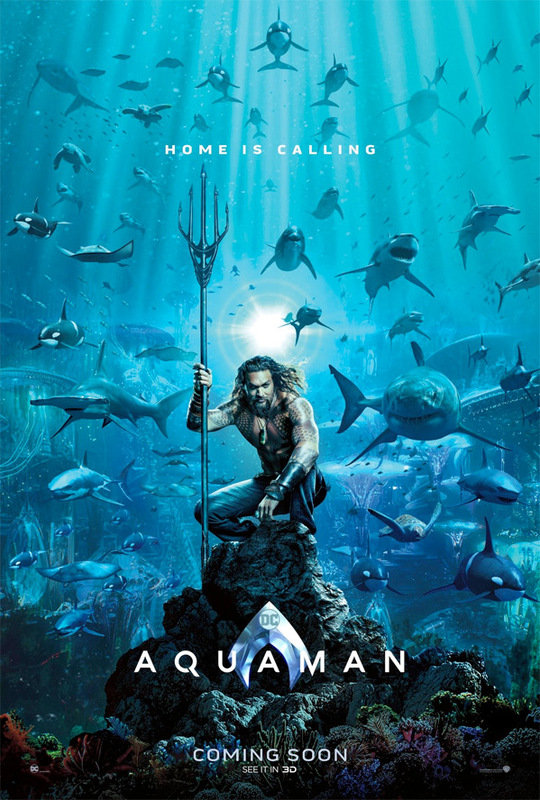 Following the events of the Justice League movie, Arthur Curry (Jason Momoa), the reluctant ruler of the underwater kingdom of Atlantis, is caught in a battle between surface dwellers that threaten his oceans and his own people, who are ready to lash out and invade the surface. Aquaman is directed by Australian filmmaker James Wan, director of the films Saw, Dead Silence, Death Sentence, Insidious, The Conjuring, Insidious: Chapter 2, Furious 7, and The Conjuring 2 most recently. The screenplay is written by Will Beall, from a story by James Wan, Geoff Johns, and Will Beall. Based on the DC Comics character created by Mort Weisinger and Paul Norris. Warner Bros will release James Wan's Aquaman in theaters everywhere starting on December 21st during the holidays later this year. First impression? So how does this DC movie look?